The Apple Watch is a pretty fun toy to use to keep up with your notifications on the go and track your daily fitness activity. You can do a whole lot more with it though. Take the Hyundai Blue Link app for instance. It is a simple app that lets you control your Hyundai from your wrist. The app lets you start, unlock, find your car fast. 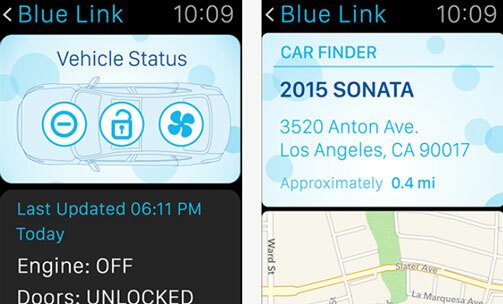 Blue Link lets you start your vehicle, unlock/lock doors, activate lights, and send points of interest to your vehicle. The app also gives you access to previous POI. The app helps you find your car as well. You are going to need a subscription to use the app though. The Blue Link app simply helps you control your Hyundai car easier. It is not without its flaws, but we are going to see many more apps like it in the future.